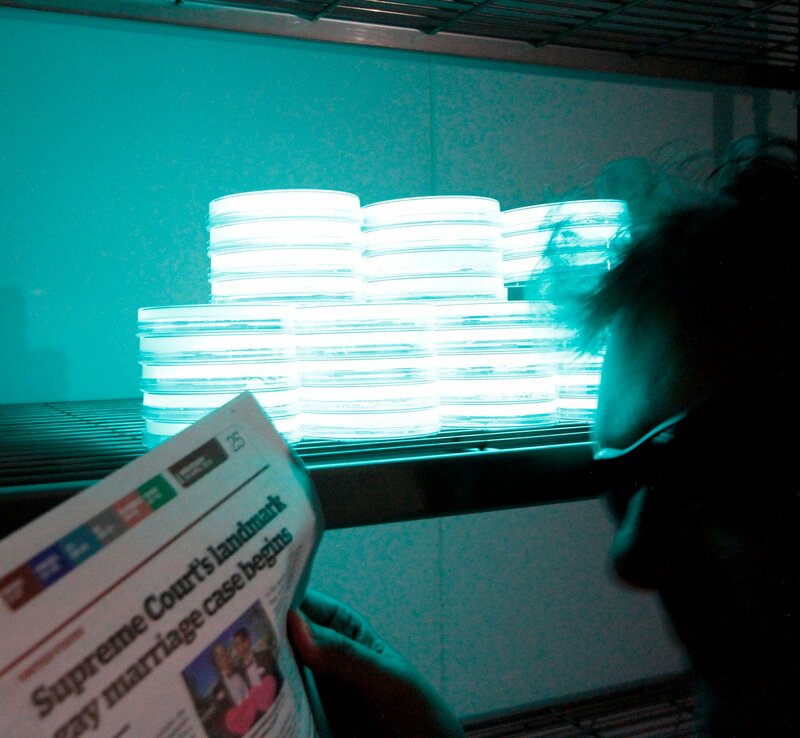 Yes, that’s me reading a newspaper using just the light from Photobacterium phosphoreum HB. 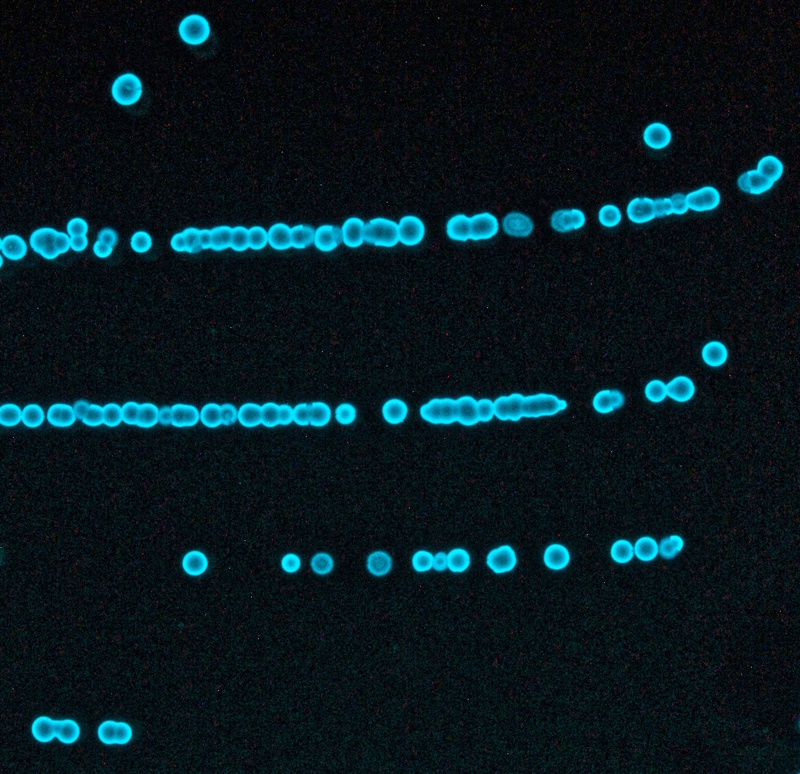 As a PhD student in the 1980s, part of my research project was to clone the genes that encoded the light producing machinery from naturally occurring bioluminescent bacteria, into more familiar bacteria like E.coli, and Staphylococcus aureus, where the light that these now produced as a consequence of my genetic interventions could be used to measure gene expression and viability. 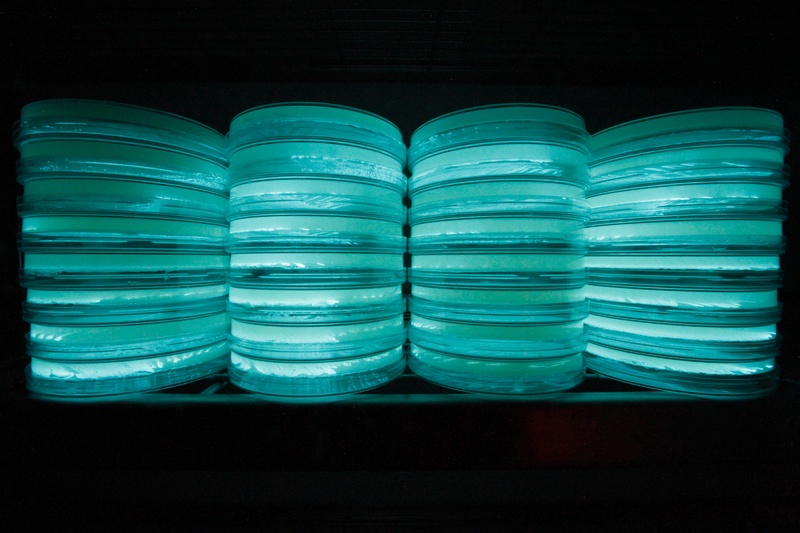 I would often spend hours in a darkroom, waiting for my eyes to become more sensitive in the dark, and then looking for the tell tale blue-green glow to tell me that my cloning experiments had worked. 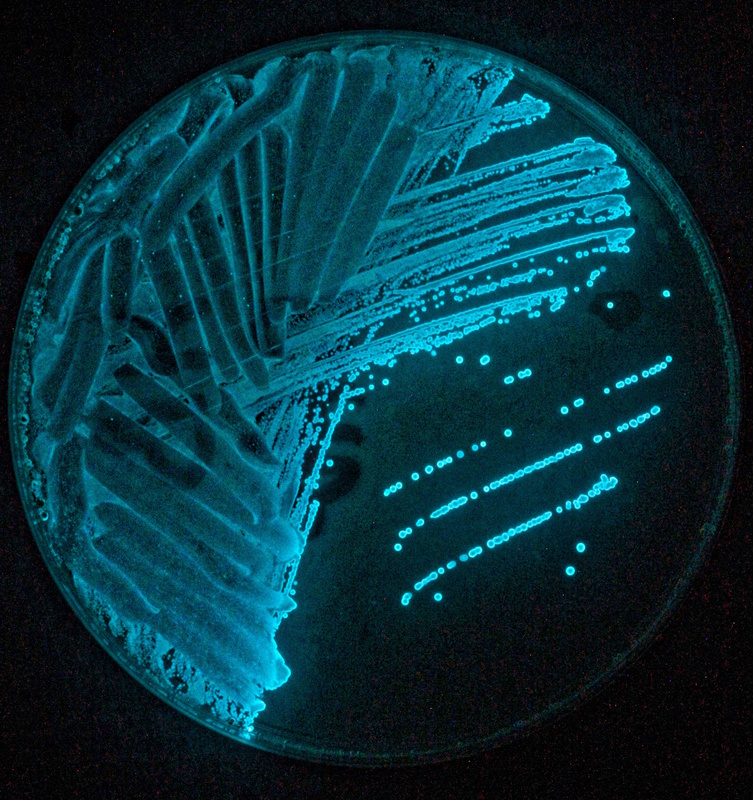 I’ve been beguiled by this unique biological light ever since, and have used it in my teaching to engage microbiology students. Quite often I’ve also taken this phenomenon outside the laboratory in order to share its wonder with the public. 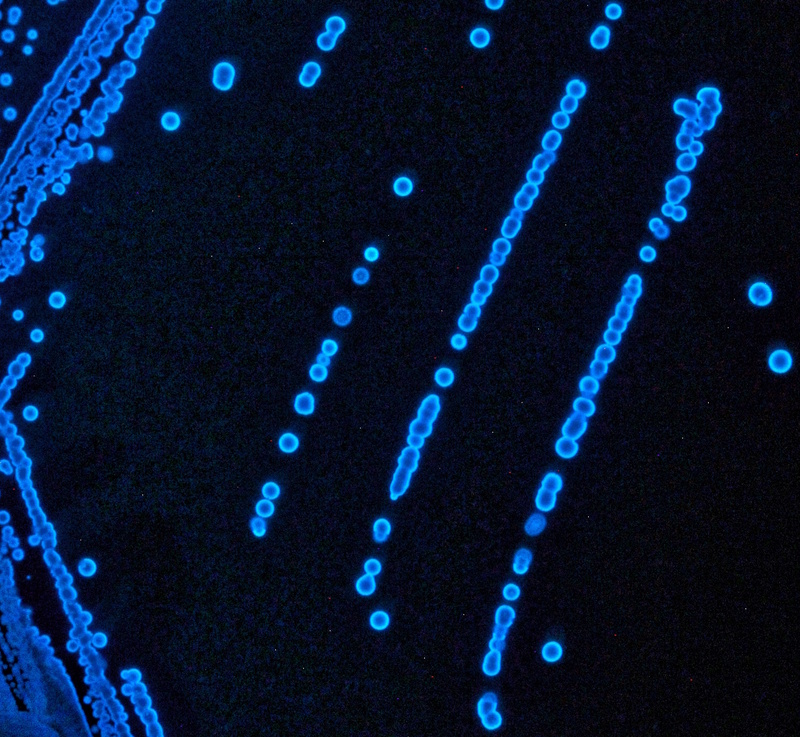 My latest bioluminescent adventure is with artist Anna Dumitru, and will be an installation based on the bioluminescent bacterium Photobacterium phosphoreum HB, and will feature at the Wellcome Trust’s On Light event running from 1st to 4th May. These forms are made by the wind interacting with a viscous medium. 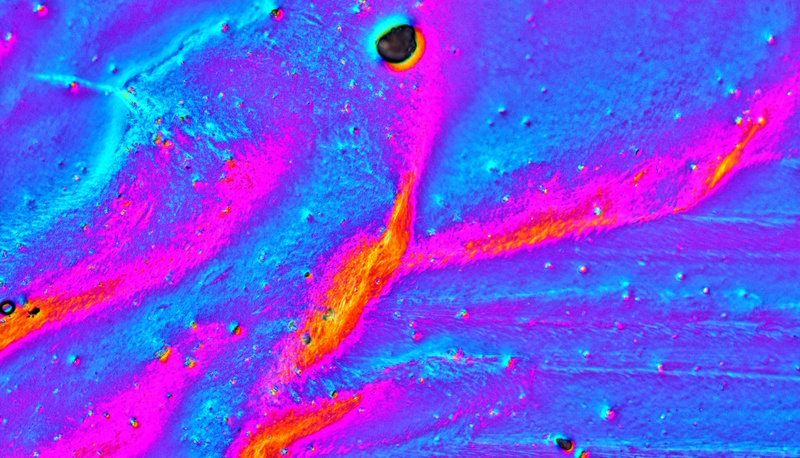 To make them, I attached glass slides to my car, travelled at speeds up to 70 mph and then observed the forms using a DIC microscope (100-200x magnification). I’ve been obsessing recently about the letter m.
Last week as part of our AHRC funded Metamorphoses project, Sarah Craske and myself took a copy of Ovid’s Metamorphoses from 1735, to the Surface Analysis Labs at the University of Surrey for analysis with Energy-Dispersive X-ray Spectroscopy. As preparation for its analysis, the paper had to be coated with a layer of elemental gold of just 0.7 nanometres in depth. For reference, gold leaf is typically around 0.1 micrometres in depth, and thus ~140-times thicker. So we placed the ancient paper circle into the sputtering machine. 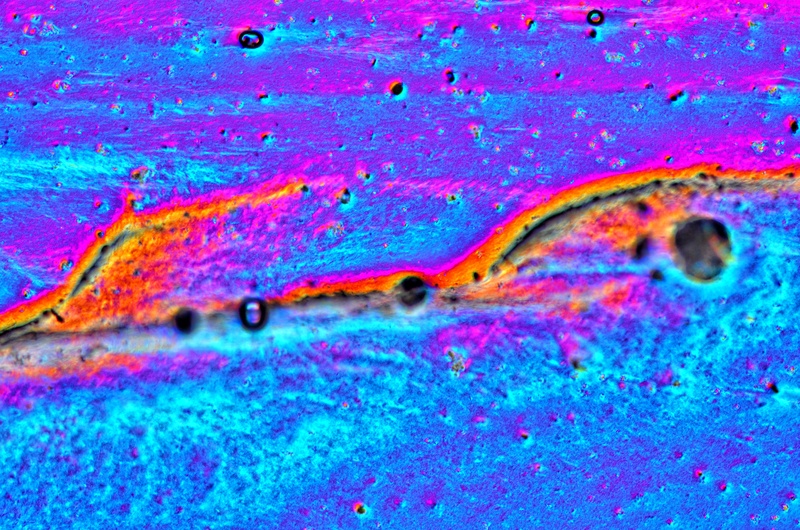 At an appropriate state of vacuum, a swirling deep purple (maybe that’s where the got their name from) plasma flashed into existence, and danced briefly over our paper. When the paper was removed from the device, it had the faintest golden sheen to it, and I’m guessing that it had gained a little bit in value because of it diaphanous coating of gold. For the analysis itself, our fragile and ancient paper disk was placed into a JSM-7100F Field Emission Scanning Electron Microscope (£500,000 worth of hardware) and its acceleration voltage ramped up to 5.0 kV. The principal behind Energy-Dispersive X-ray spectroscopy (EDX) is that a high-energy beam of charged particles (electrons in our case) is focused into the sample of interest. The energy of the incident beam is such that it can eject an electron in an atom of the sample from the inner shell, creating an electron hole where the electron once was. Finally, an electron from an outer, higher-energy shell will then move in to fill this hole, and because it is more energetic than the hole that it now has to occupy, it releases this difference in energy as an X-ray. These X-rays are unique and indicative for each individual element, so that when they are measured, they reveal the identity of the element that they came from. The machine then began to slam electrons into our ancient paper at speeds approaching that of light itself. Remarkably, as we watched the results of the high-energy electron collisions, and the collected X-rays from these accumulate on the computer screens before us, the letter m, the last letter of “nondum” began to form. Unlike our own eyes, which see the letter m because of the way that the ink interacts with light, the machine sees the letter for what it is really is, that is a small area and design made nearly 300 years ago from the element carbon. Chemical systems carefully brought to the point of phase transition and then released from my control. 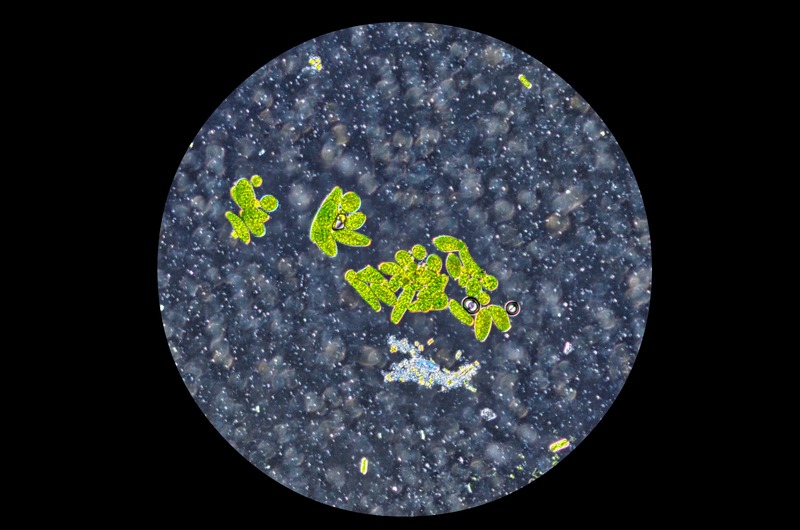 Some images of what I found in a drop of pond water using a DIC microscope at 100x magnification. Playing with representing the images as circles. The obsession with crystallisation continues. 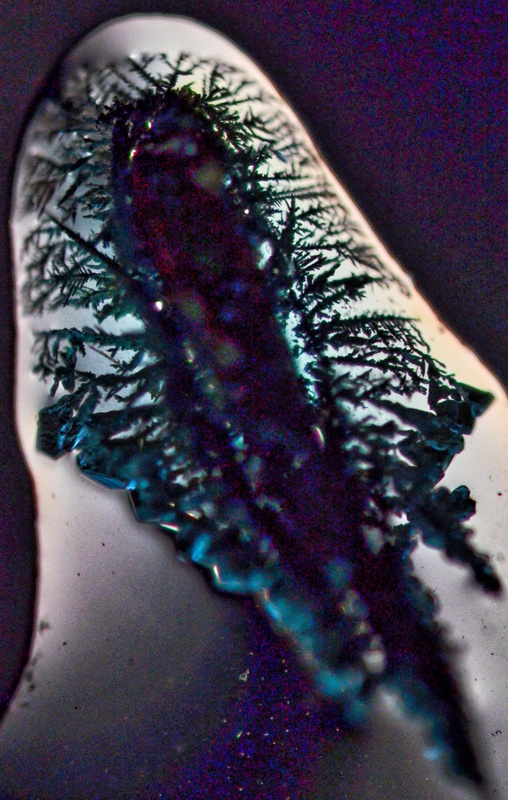 A beautiful tree made of pure silver emerges after I placed a minute shard of copper into a drop of sliver nitrate. It’s classical example of a simple displacement reaction. I did make a video but the process was so quick that I couldn’t capture it! Another work which explores two current strands of interest, one new, and the other far older, and from my teenage years. 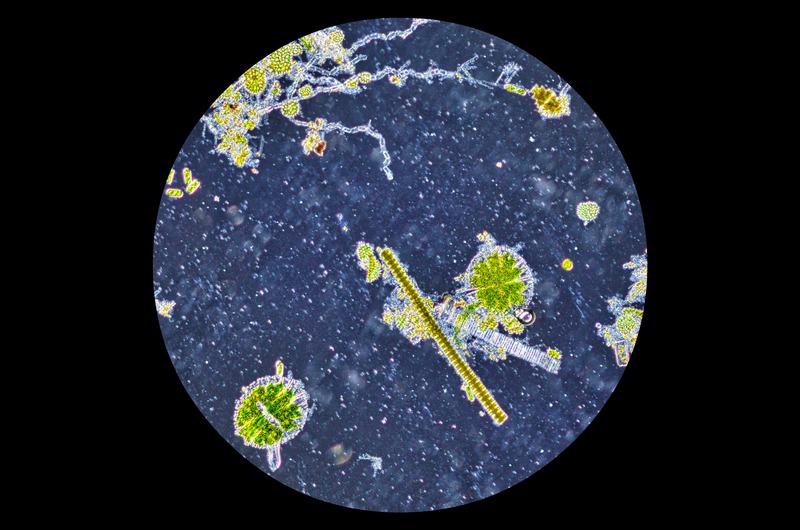 The most recent theme is the concept of vitalism, a theory that held that living organisms were fundamentally different from non-living entities, in that they contained some unique non-physical element called the vital or life spark. 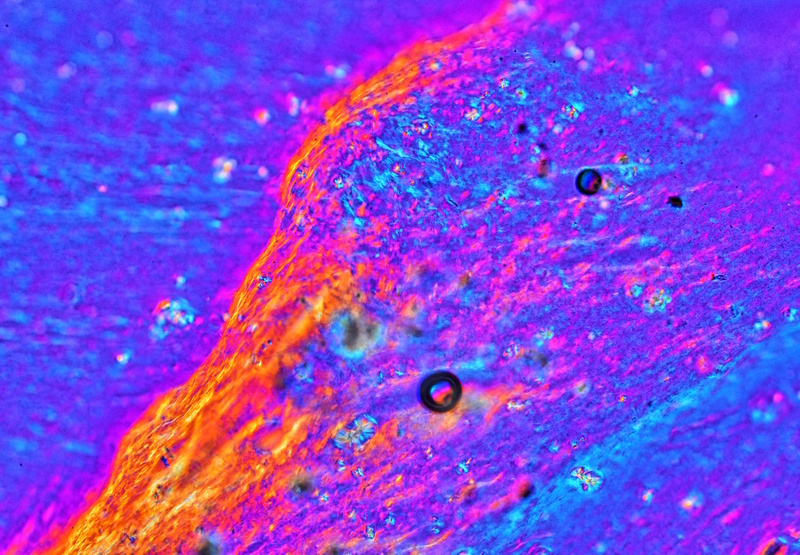 The older strand, and I think that it’s fair to call it an obsession now, is the process of crystallisation. I can trace this back to a period of two days when my teenage mind was exposed to the wonder of J.G Ballard’s The Crystal World. 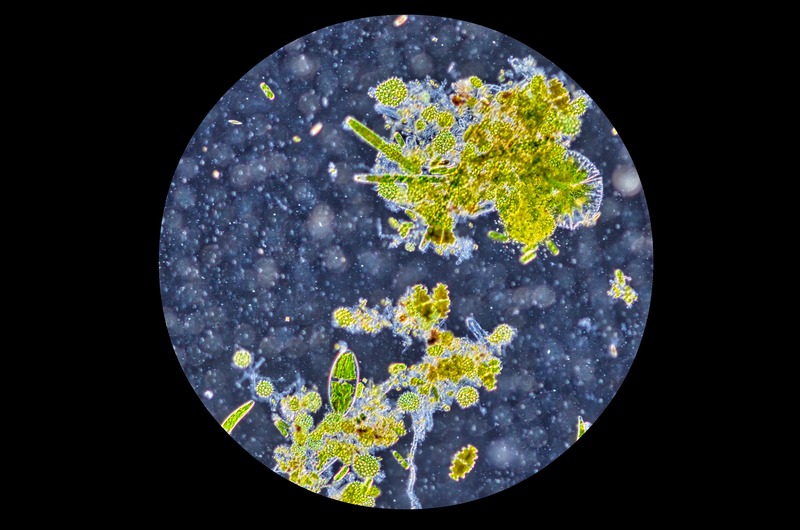 So here I am many years later, adding Urea, the synthesis of which by Friedrich Wöhler led to vitalism’s demise, to a culture of my own epithelial cells. 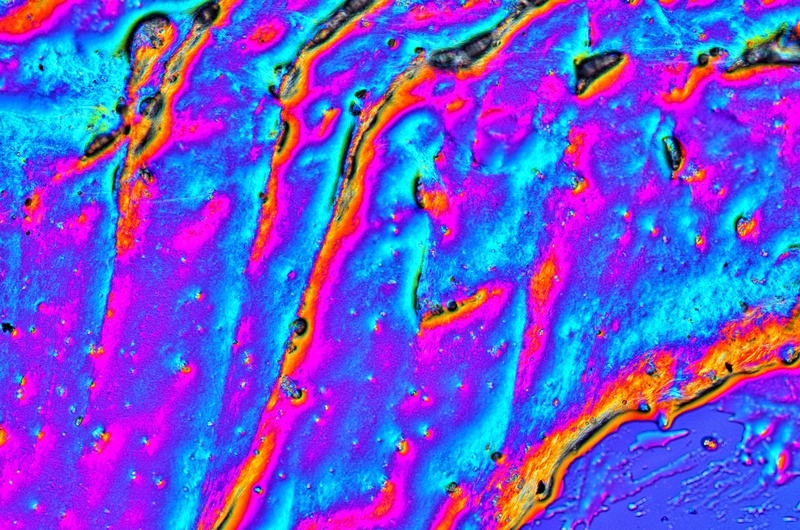 If you look closely to can see my cells with their nuclei being killed and penetrated by various types of crystallisation processes. Death by a thousand cuts!